Welcome to Pachamama’s Beautiful Food! I am filled with wonder and joy every moment and especially every morning when I walk outside and witness Creation first hand in my garden. Feeling, seeing, nurturing, hearing — which plants are speaking out, asking for, teaching me. And listening, with a fluid sense by-passing the ears themselves, inwardly, hearing as if the plants are speaking through my heart then I follow their heart’s wishes and needs instinctively. 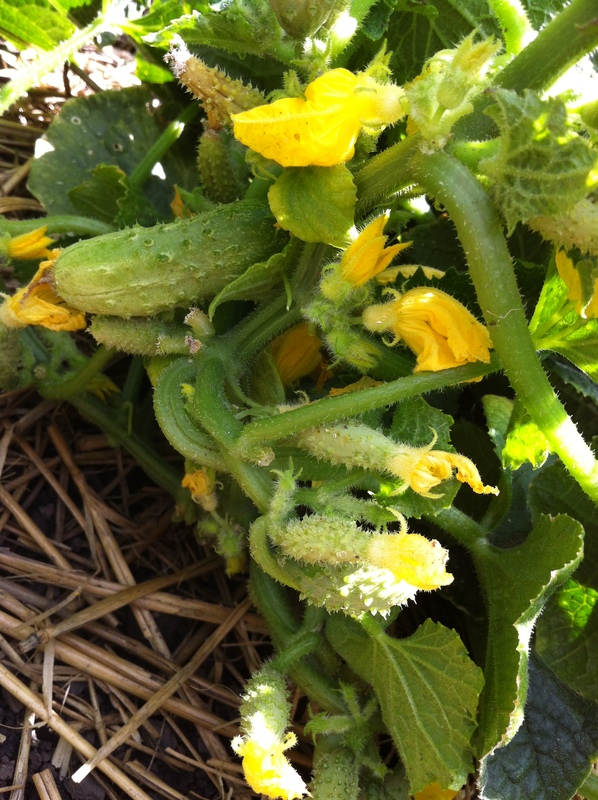 The pickling cucumbers are certainly loving these communications – uplifted onto an inch or two of straw, the baby cukes are lifted away from thread worms seeking them out when they nestled against the soil. I can hardly wait – twelve plants covered with blossoms and tiny future kosher dill pickles are loving the conditions of the garden and weather. 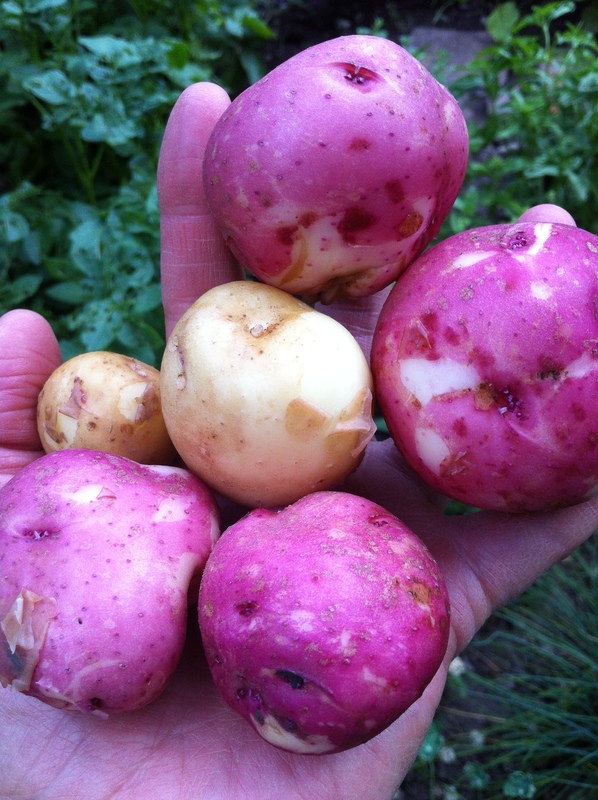 And I was so glad today, digging the first potatoes – red pontiac heirloom and yukon golds. 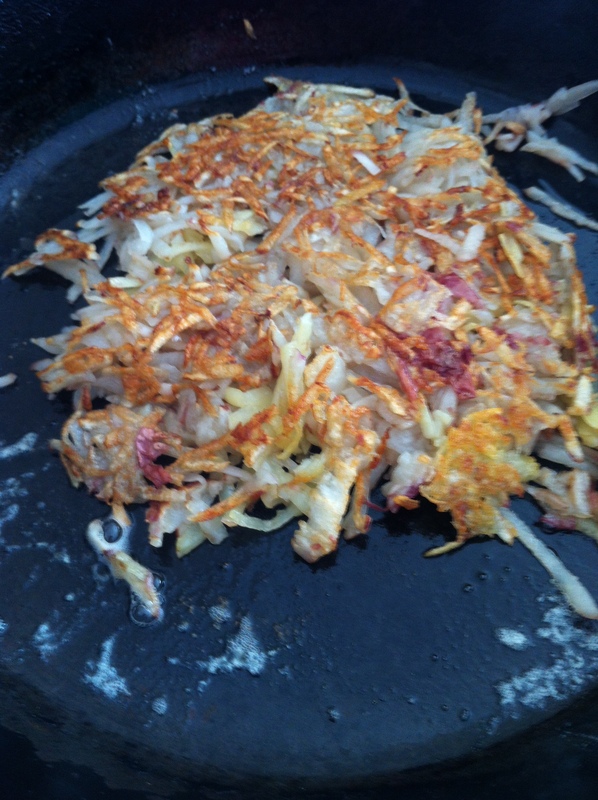 Washing them, shredding them and letting them sizzle in the cast iron skillet with simply butter, salt and pepper. What does it mean to me? It is deep and complex, at the same time the very essence of simplicity. Our spiritual connection with Mother Earth, and the nature of truly being connected. Letting go of the illusions of separation that can exist in a supermarket, peering through plastic bags of potatoes to see if these are acceptable. Looking at prices and deciding this way, with a certain judgment. Growing the potatoes myself brings me to instant and unconditional love – digging and the discovery, the unearthing, and exclamations of joy! Thank you for growing in this soil! Whatever you look like is perfect! My relationship with you, planting, sending energy, watering, watching you flower, knowing then your potatoes are multiplying, under the earth = true love, coming from garden to sink to cutting board to pan to plate. 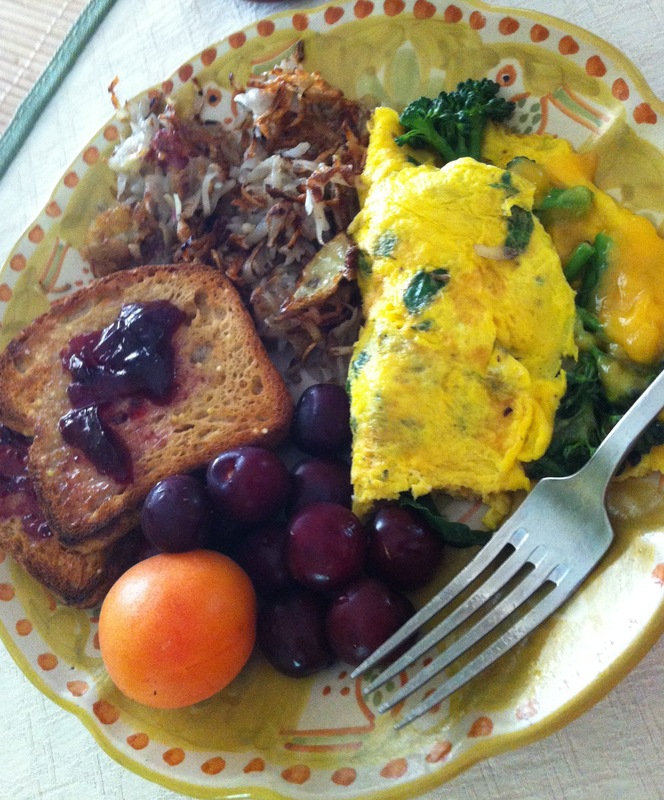 There is such deep gratitude for cooking “The Classics”, hash browns, broccoli, basil and sharp cheddar omelette, toast, butter and grape jelly, fresh fruit — when I have grown and dug and washed the potatoes, picked the broccoli and basil…, received the biodyamically raised chicken eggs from local friends, picked the cherries, selected locally grown apricots at the market, spread the toast with concord grape jelly I put up last fall. I simply love it, and I love to share my experience with you. Blessings.